Do you enjoy community service? Would you like to be interviewed about your experiences on the radio? 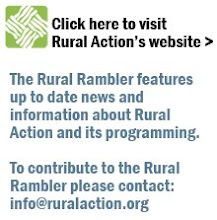 Rural Action seeks community volunteers and activists for upcoming editions of “Volunteer Action,” a commercial-free radio show airing each Tuesday from 10:06 to 10:36 a.m. If interested, contact Sara at 740-767-4938 or sara@ruralaction.org. The Huff Run Watershed Restoration Partnership (HRWRP) is holding two Huff Run Awareness days, May 4 and May 11. HRWRP needs skilled volunteers to help out with a macro-invertebrate lesson, macro helper, acid mine drainage chemistry, electro fishing helper, and a site tour helper. We would really appreciate your help. For more info, contact: Terri Sponaugle-Schrock, terri@ruralaction.org. Last year’s Annual Dinner at Camp Oty'Okwa in the Hocking Hills was a rousing success. Want to help plan this year’s dinner? Contact Lee Gregg at gregg@frognet.net. Remove Invasive Plants AND Restore Our Forests! Who: Anyone interested in helping to keep getting into the woods and doing their part to help save our native wildflowers. What: PLEASE Join Rural Action, Athens Trails, OU Plant Biology Department and Athens Conservancy and other volunteers to pull garlic mustard. Why: Garlic mustard is a non-native invasive plant of particular concern in Ohio because it displaces many favorite native plants like trillium, trout lily and blue cohosh. One of the most effective strategies for controlling garlic mustard is to pull it out by hand before it sets seed. So get your hands dirty and spend time enjoying the beautiful spring weather! Volunteers should bring work gloves, water, snacks/lunch, sunscreen, and a hat. 1-4 PM, meet at Sell’s park in Athens (At the end of Avon St. off of E. State). Please contact John Knouse at 740-589-4575 or jknouse@frognet.net for more information. Meet at 11 AM at the auditorium building on The Ridges. Workers are needed until 3 PM. Group leaders: Phil Cantino, Tanner Filyaw, Elise George. Bring a lunch. We will focus on a woodland called “The Cove” off of St. Rt. 682. No more than 1 mile walk, round trip. 1-4 PM, meet at Sells Park in Athens (At the end of Avon St. off of E. State). Group will leave PROMPTLY at 1:00 to hike into the site in Stroud’s Run. Please contact Shana Byrd at 740-767-2090 / shana@ruralaction.org, if you plan to attend. 11-2, meet at Sells Park in Athens (At the end of Avon St. off of E. State). Meet with a bicycle in the parking lot behind Porter Hall at 1 PM. Group leader: Phil Cantino. We will bicycle to the work site, which is along the bike path between Armitage and The Plains (9 miles round trip). Alternatively, you can drive to the end of Armitage Road, where there is a small amount of space for parking, and meet us there about 1:20. Workers are needed until 4 PM. Please e-mail me (cantino@ohio.edu) in advance if you plan to come on this outing. In case of rain, this outing will be postponed until April 22. If the weather is questionable, call me Sunday morning after 9:00 (594-3338; 593-1128) to find out if the outing is on. 1-4 PM, meet in the parking lot at the bottom of the dam. Group will leave PROMPTLY at 1:00 to hike into the site. 11-2, meet in the parking lot at the bottom of the dam. Group will leave PROMPTLY at 11:00 to hike into the site. Please contact Shana Byrd 740-767-2090/ shana@ruralaction.org, if you plan to attend. April 29th & 30th RAINDATES ­ if the weather is anything more than a drizzle for both weekend days, the weekend’s events will be rescheduled for these dates (same times apply). More info will follow if we reschedule. These events are being organized by Rural Action, Athens Trails,OU Plant Biology Department and Athens Conservancy. Activities: Mulching, Trailwork, and a Tour.